Heat oven to 350°F. Spray cookie sheet with cooking spray. Cut zucchini in half lengthwise. Scoop centers from zucchini, leaving 1/4-inch shells; reserve centers. Place zucchini shells on cookie sheet. In food processor, place zucchini centers, spinach, onion, basil and garlic. Cover; process until well blended, stopping to scrape down sides if necessary. In 12-inch skillet, heat oil over medium heat. Cook spinach mixture and bouillon in oil 3 minutes, stirring occasionally. Stir in tomato and bread crumbs; remove from heat. 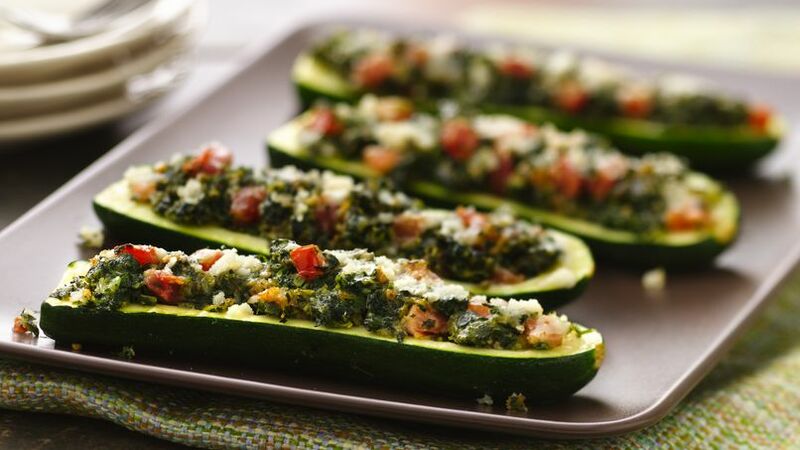 Divide spinach mixture evenly among zucchini, filling each shell; sprinkle with cheese. Spray piece of foil large enough to cover cookie sheet with cooking spray; cover zucchini, sprayed side down. Bake 15 to 20 minutes or until zucchini is tender and cheese is melted. Fill zucchini with spinach and Progresso® bread crumbs mixture for a flavorful side dish.